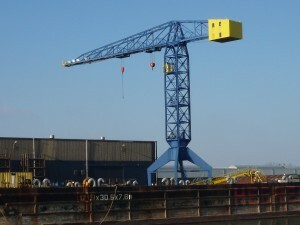 This is a 1:20 scale model of a shipyard crane, working in the port of Vlissingen, The Netherlands. It took me about 6 months to build it. 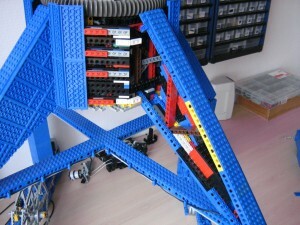 The model weighs 16,6 kg (including some non Lego counterweight). 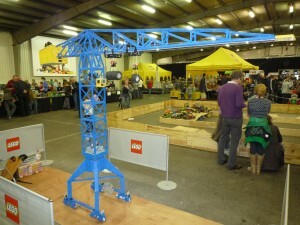 The height is 2,25 m, the length of the jib (from tip to the end of the yellow machinery room) is 3 m. The wheel base is 0,5 m.
For the slewing bearing I used “hail fire droid wheels”. (See more in category Construction Solutions). The scale 1:20 was forced upon me by the use of the hail fire droid wheels for slewing. Fortunately the relation between the dimensions of the lattice construction of the tower and the jib, and the dimensions of the Lego parts used, proved to be within acceptable proportions, and quite pleasing to the eye. 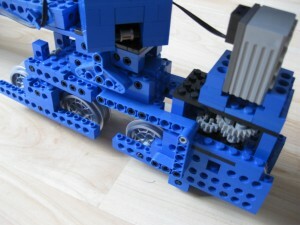 Moreover, a Technic figure could be added as a driver. 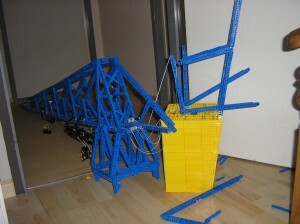 This resulted in a rather slender construction of the jib, close to the strength limitations of the Technic bricks used. During building this once resulted in snapping of some 1 x 16 bricks. Building big models leads to big failures! 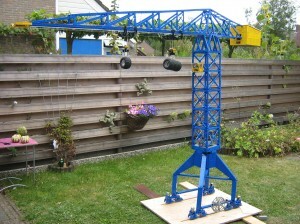 This is the crane in reality. The crane has two slewing motors. As in reality the motors and gearboxes can move around their pinion shafts. 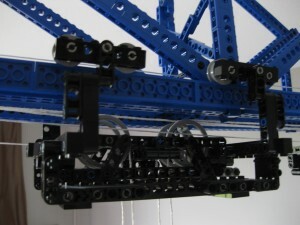 This movement is limited with rubber buffers, which serve to slow down the jib motion at the moment the motor brakes are applied. 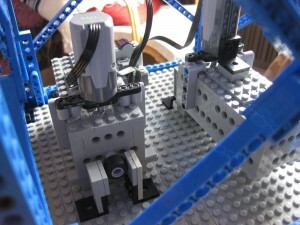 Use of two Lego motors to drive 1 slewing ring proved to be a problem due to speed differences. This resulted in regularly wringing loose of one of the slewing gears during frequent demonstrations on the model fair. This shows some on the internal connections between the crane legs and the pedestal. The trolleys travel along the jib over the edges of 2 stud wide plates. 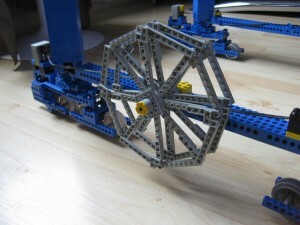 Here the connection between the crane legs and the wheel bogeys is shown. Note the 45 degr. angle between legs and bogeys. The crane load is distributed evenly onto 2 x 2 wheels at each corner. The reduction gear proved to be quite a challenge to get it into a very narrow space. Old high speed motors were used (I was out of PF motors) while the crane traveling speed had to be very slow.